An aromatic long-grained rice grown on the Indian subcontinent. Like all rice, basmati is found in both brown and white forms. The rice is characterised by its long grain size, which expands when cooked to produce fluffy elongated shards. Brown basmati is usually covered by a light brown husk. The colour of a basmati is translucent, creamy white. Brown Basmati Rice is also available but the most commonly used is white Basmati. The grain is long (6.61 - 7.5 mm) or very long (more than 7.50 mm and 2 mm breadth). 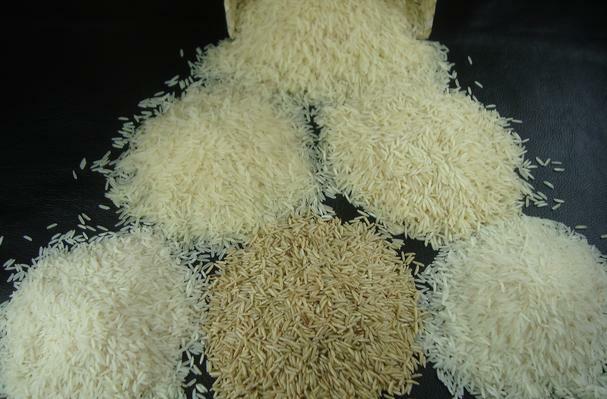 Shape or length-to-width ratio is another criteria to identify basmati rice. This needs to be over 3.0 in order to qualify as basmati. Dry, firm, separate grains. Upon cooking, the texture is firm and tender without splitting, and it is non-sticky. (This quality is derived from the amylose content in the rice. If this value is 20-22%, the cooked rice does not stick. The glutinous, sticky variety preferred by the chopsticks users has 0-19% amylose). The rice elongates almost twice upon cooking but does not fatten much. When cooked the grains elongate (70-120 % over the pre-cooked grain) more than other varieties. Flavors: Nutty - particularly emphasised for brown basmati. Mouthfeel: Grains are easily separated and are firm to the tooth when cooked to perfection. Choosing: # Make sure it is aged/ old rice. Check the label or ask your grocer. The new rice will become sticky when you cook. # Make sure it is long grained and does not contain too many broken grains. # It should be free from stones and other unwanted things. You may need to separate those things before you cook rice. Buying: Some good brands of Basmati rice available from India and Pakistan are Tilda Basmati rice, Lal Quilla basmati rice, Kohinoor basmati rice etc. Basmati is sold under many brand names such as Kohinoor, Dawat, Tilda, Dehra Dun, Pari etc. It is long grain rice and cooks fast. Though it is a bit expensive compared to the other varieties of rice, it is in demand for it's delicate flavor and wonderful taste. Procuring: Basmati rice fully flourishes in places where there is a good combination of climate and soil conditions. Typically, in the Northern parts of India and a few parts of Pakistan, such unique combination are available and it is in these parts, the best Basmati rice are grown. Basmati rice grows in Lowland rainfed or irrigated areas as well as in Coastal wetland areas. The plant of the basmati rice grows very tall and is weak, thereby making it prone to lodging. The plant should be sowed timely to ensure good yield and quality. Basmati rice grains are longer than any other grains of rice. When cooked, the grains of Basmati rice become even more longer and do not stick to each other. The texture of the rice is dry and firm. It has a distinctive fragrance which makes it unique and different from other varieties of rice. Brown basmati rice is one of the healthiest food options available as it has a very low Glycemic Index. Cleaning: Soak the rice overnight to produce a fluffier product when cooking. Rinse the rice at least twice under cold running water to get rid of excessive starch that might cause grains to stick together. # Store rice in a dry and cool place. Put it in a container with a tight lid. # Rice should be stored away from moisture and open air. Rice will get moldy if exposed to moisture. Basmati Rice is available in white and brown rice varieties. The brown rice variety is the unprocessed, unpolished variety which contains more fiber and the nutrients. It takes longer time to cook compared to white rice. White rice has more flavor. History: Basmati Rice is a simple grain, yet throughout history it has been on royal menus of various cultures as the main dish. From the pilav of Turkey, polou of Persia, pilafs of the Steppes, the isotos and paellas of the Mediterranean, to the pulau of India it has been served to great sultans, maharajahs, shahs and emperors. Spices, nuts, dried fruits, vegetables and herbs are a natural for Basmati rice. Basmati rice transforms rice dishes into extraordinary meals. Also known as the "Queen of Rice", this highly aromatic grain that is long and elegantly thin, has originated from Vasumati which means earth recognized by its fragrance. The full exposition of the word is from Hindi. Bas originating from Prakrit Vas which has a sanskrit root- Vasay connoting aroma; and mati from mayup meaning ingrained from the origin. Common usage has changed Vas to Bas while joining bas and mayup the latter changed to mati.. Thus the word Basmati originated. According to Ayurveda, Basmati, the king of all varieties of rice, is saatvic or pure, is nourishing for the body tissues and is easy to digest. Basmati Rice has been cultivated at the foot of the Himalayan mountain ranges in India for thousands of years. The rivers Yamuna and Sutluj irrigate the Basmati paddy fields in Haryana and Punjab respectively. To obtain the correct aroma and flavor of Basmati rice, proper ageing is required to reduce its moisture content. The best quality Basmati rice comes from the old Karnal district, known as the 'rice bowl of India'. Basmati is now grown in Karnal, Panipat, Kaithal, Kurukshetra and Ambala districts of Haryana. It is also grown in Punjab, Dehradoon region of Uttranchal and Jammu region of Jammu & Kashmir.